OUTCentralOregon, in partnership with Mt. 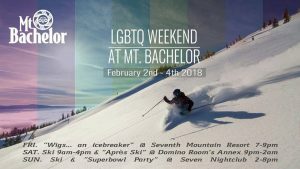 Bachelor, announces the first ever ‘LGBTQ Ski Weekend at Mt. Bachelor’ in Bend, Oregon, February 2-4, 2018. 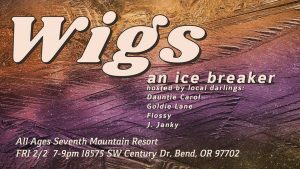 This is a full weekend of events, including nighttime ice skating, alpine and cross-country skiing, snowshoeing, a night-time dance party in downtown Bend, and more! The weekend starts off with a nighttime outdoor ice skating event at Seventh Mountain Resort. Called ‘Wigs…. 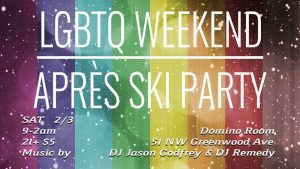 an icebreaker,’ skate with old and new friends, meet up with ski buddies, pick up your lift tickets, and get ready for a fun weekend of skiing at Mt. Bachelor with our LGTBQ+ community and friends. To make this more fun and memorable, join us wearing your favorite wig, a festive outfit, and get your skate on! Meet us at Mt. Bachelor, West Village (out in front of Mountain Gateway building) between 9am and 10:30am. There will be an information booth to pick-up lift tickets, find a ski group, ask questions, and enjoy skiing beautiful Mt. Bachelor with new and old friends. Wrap up the weekend with more Skiing at Mt. Bachelor and “Super Bowl Party” at a ‘Seven Restaurant and Nightclub’ in Bend.